Who is grinding a scythe over there, which crystal is shining in that cave? It’s time to pick up our magical binoculars again. We are now standing in the eastern part of Lake Cerknica, in the village Gorenje Jezero, at the settlement Hrastene Njive, where the new educational trail begins. It is February of next year (2020) and some parts of the trail are underwater, because the early spring rains filled underground caves. 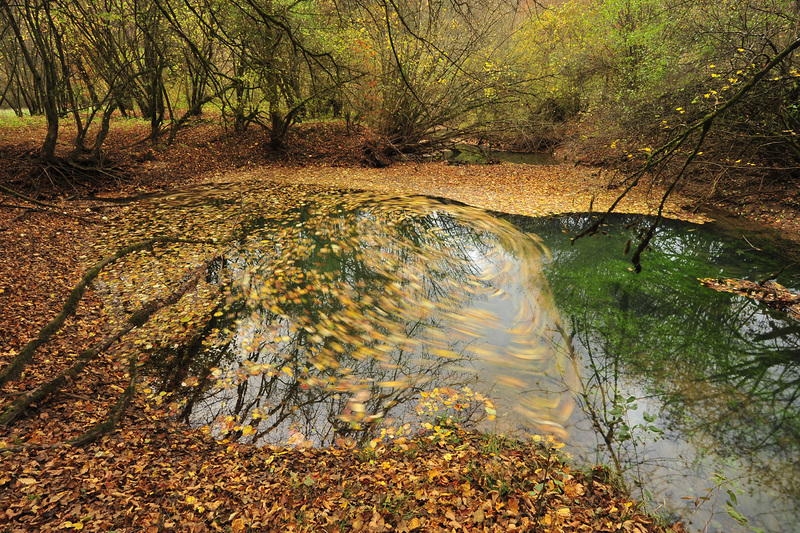 In this area, the underground river Obrh or Stržen (Obrh flows through Loško field, and is renamed Stržen when it flows to the Cerknica Lake area) springs out of a score of crystalline springs. The springs through which Obrh resurfaces are currently active and are sparkling beautifully in the early spring sun. One hundred meters away, another shipment of the river Obrh erupts from the underworld with all its force. Let’s jump to May, when there is only a sample of water left and most of the springs are dry. Due to low water levels, rich vegetation with many rare plant species shows up. Wait, who’s grinding a scythe over there? Can you hear it? “Krrek kreek…” It’s a corncrake! Corncrake (Crex crex). Its typical “krrrek – krrrek” resembles the sound of sharpening a scythe and gave it its scientific and Slovenian name. In a calm night, it can be heard up to 1 km away. With a bit of luck, we may see it through the thick grass, if we look closely. Corncrake is a very shy bird. During summer months, the nest is built from dead stems and leaves on unmown meadows. Unfortunately, it is precisely because of this habit that many hatchlings meet with premature death. They are killed by mechanized mowing of meadows. 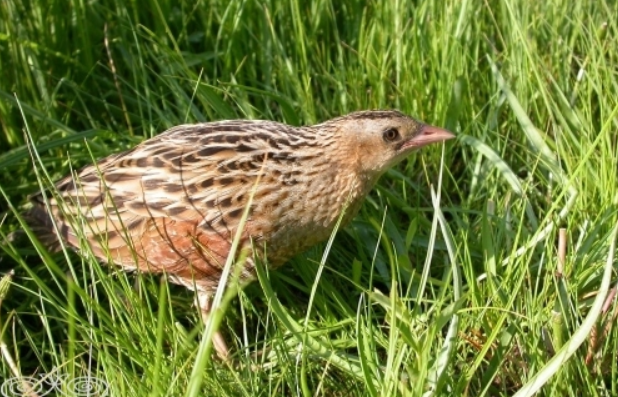 Because of the extraordinary corncrake’s sensitivity, the educational trail will be set up in such a way that visitors will disturb it as little as possible, especially during the nesting season. 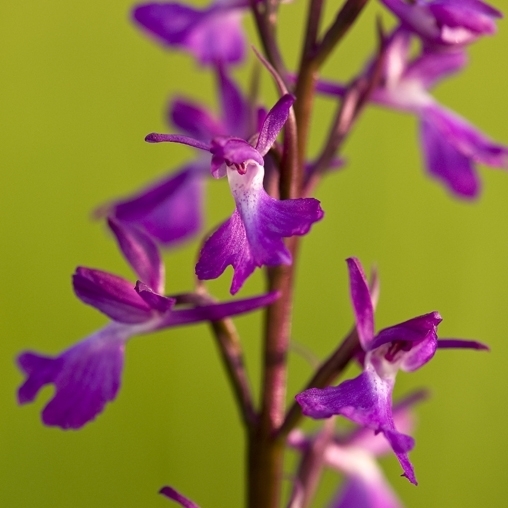 Another very rare and valuable species is Orchis plaustris, which we can see swinging in the wind, if we look through the binoculars. As it thrives only on wet and non-fertilized land, the area where it can grow is shrinking. Another vulnerable species, which can be seen along the edge of this educational trail, is the smooth newt. It is listed on the Red List of Endangered Amphibians. Its habitat are minor standing waters without fish, which eat its eggs and larvae. Smooth newts love water fleas and larvae. On land, they feast on earthworms and snails. 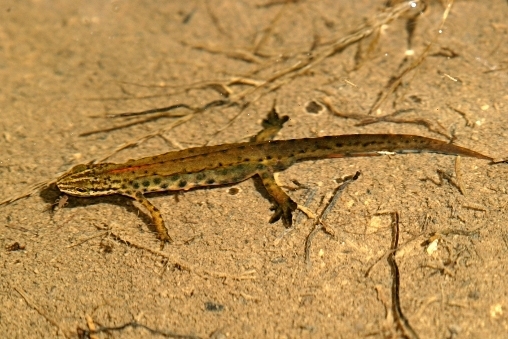 The smooth newt spends most of the year on land, in the riverine vegetation. Educational trail “Koščeva pot” is interesting in all seasons. 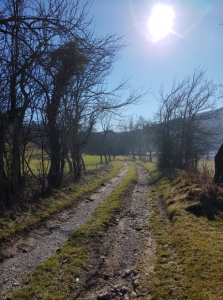 Walking along “Koščeva pot,” which is 2.5 kilometres long and ends in the village Laze near Gorenje Jezero, we can always count on some surprises. From water springs to special and rare plant and animal species. There are informational boards every few meters of the trail, 11 in total, so you always know to what you should pay attention. 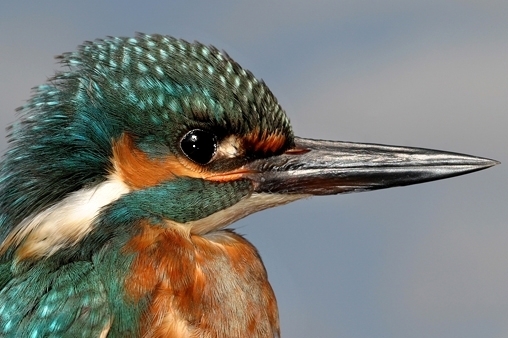 On the way, you might spot the Kingfisher. By consolidating river banks and regulating watercourses, humans are degrading the living space of this wonderful bird. 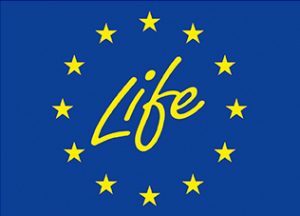 As a consequence, the species is listed in the Red List of Endangered Species as highly endangered in Slovenia. 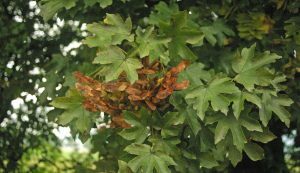 Field maple – a deciduous tree from the family of maple trees. Due to its hard and durable wood, it was once used for making lances and spears. Let’s jump right into the very near future, to June 2019. 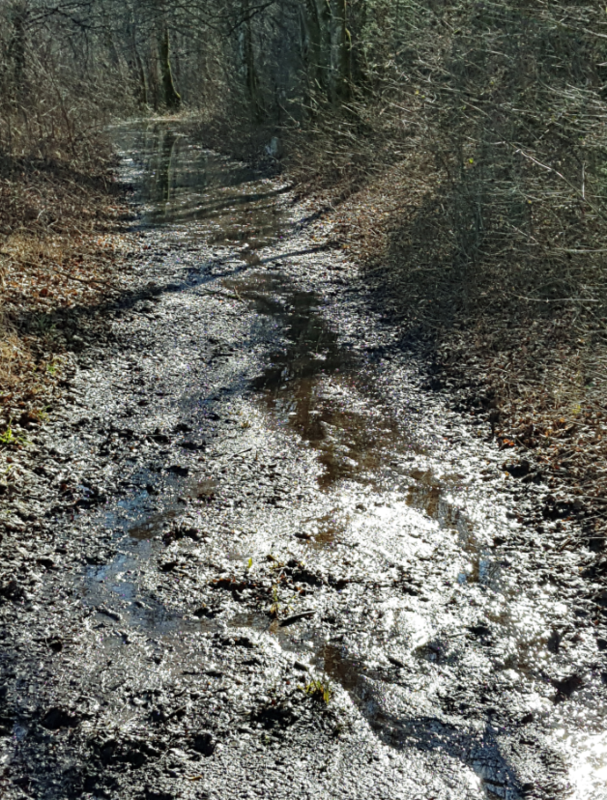 Our diligent technical workers are manually cleaning the route of the trail, full of foliage and the remains of the flash flood that followed the extreme sleet in 2014. 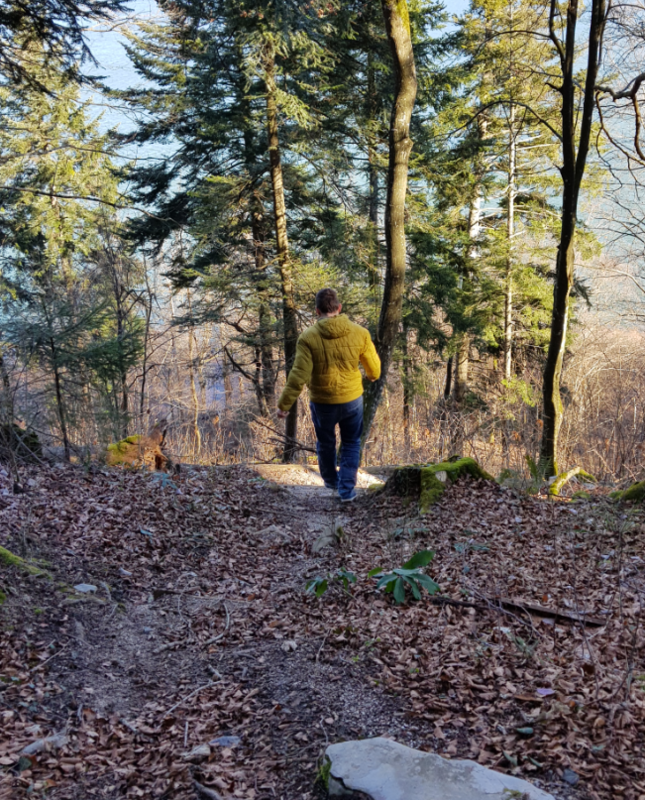 The removed overgrowth will be grinded into wood cuttings with which they will cover hiking trails, as they did in previous years in Rakov Škocjan. The first curious hikers will be able to walk along this path in December of this year. This trail will be established in the scope of project KRAS.RE.VITA.